Your picture choice has distracted me from the lame ipod touch news. Hello Zune HD. 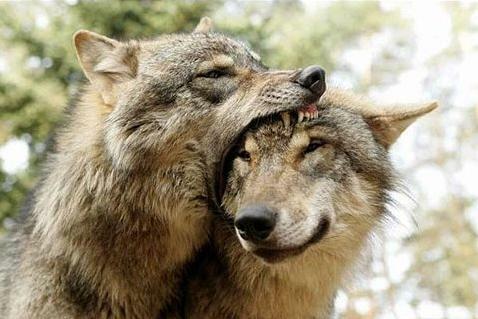 That wolf is totally eating that other wolf’s head. I would like to point out that you are still wrong. There is only one Wolf eating the other’s head. That is not a bi-lateral activity. Please correct the post. Actually, for your information, just before this picture was taken, I’m pretty sure that the other wolf was totally eating the other wolf’s head as well. I read somewhere that the screen of the Zune is larger than the current generation iPod and that makes it more attractive. However, I also found out that the resolution of screens of both these players is the same!! That means though the screen size is larger, the pixel count is the same, resulting in a poorer than iPod clarity for the Zune. Wonder what that will do in the market! he new Zune browser is surprisingly good, but not as good as the iPod’s. It works well, but isn’t as fast as Safari, and has a clunkier interface. If you occasionally plan on using the web browser that’s not an issue, but if you’re planning to browse the web alot from your PMP then the iPod’s larger screen and better browser may be important.